The indoor unit is mounted on a centrally-located wall within your home. 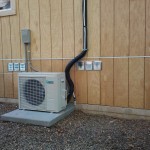 Working with your existing heating system, just one ductless system is enough to heat and cool the average sized Northwest home. Keeping your existing heating system in place ensures bedrooms and bathrooms remain at desired temperatures while the centrally-located ductless system provides heating and cooling to your home’s main living areas.